The Home Front Tube Slides are designed to fit the 2.1m (7′) high platform found on the Home Front Mountain and Monkey Climber ranges. The Home Front Tube Slide is designed to fit the 2.1m (7′) high platform found on the Home Front Mountain and Monkey Climber ranges. The slide arrives flat packed in 9 segments, and it does take time to assemble, don’t be afraid to use some force to get the bolts in! Available in green or yellow, please select your colour choice from the drop down list above. Please note that this product is only available when ordering a compatible Home Front climbing frame. 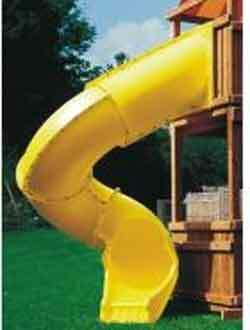 Please visit our Garden Slides department for our own range of Slides. Required platform height - 2.1m. 100 bolts, washers & nylock nuts.